This is 5V 3A Switching Regulator circuit by LM2576-5.0 is simple switching power supply 3A step down regulator for power digital circuits. Sometimes we need to work on the car or travel outside the area. The without wires internet ADSL. When using the Internet was Using 3G air cards and distributed to the Internet via wireless with “mobile wireless router”. It uses the power supply of 5V 2A. Because it is a digital circuit which uses a 10-watt high power ever. When it comes to using in cars. We can use power from the cigarette lighter of a car.But have the voltage 12 volts, so it must reduce the voltage down to 5 volts current is 2 amperes. We have a lot of choices. When before I use the transistor and IC-7805 for this job. However, when considered with caution. To its low performance. 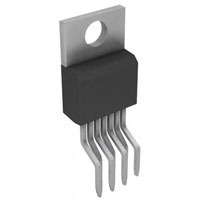 have high temperature and large, as the identity of the generally linear ICs. This work, we try to do the switching IC. IC-LM2576-5.0. (DC to DC step down voltage regulator) It is a very interesting number. It maintains a constant voltage of approximately 5 volts and current 3A. Compatible with the device easily. On the manufacturer’s manual. I smile with ease. It is very easy to use. as Figure 1. Will see that there are only four more devices only are C1-100uF, D1-1N5822, L1-100uH, C2-1000uF. The input voltage levels are 7volts to 40volts. My favorite feature is the runs with high frequency. IC is not hot. It can hold a small cooler. And Used continuously for a long time. See to circuit for read detail more. Hi, what are the exact specs on L1 100uF in terms of current? that is your require amount of current.It supports from 500mA – 3A, so as per your requirement you have design your inductor 100uH. thank you for this wonder full circuit..but i have a small question about the current required on the input side..for example i will use a transformer that has a 500mA-1A 9v specifications..would our output still be a 5v 3A? how much current in income in max load? but my question is about income of this regulator? Thanks so much for giving us an update on this subject on your blog.